The most widely reported feature of Duggie's behaviour is his eagerness to interact with dogs: originally and mainly with Ben, the golden labrador belonging to Pat Doohan of the Tory Hotel, but subsequently with a variety of island collies who have also developed a taste for dolphin swimming! 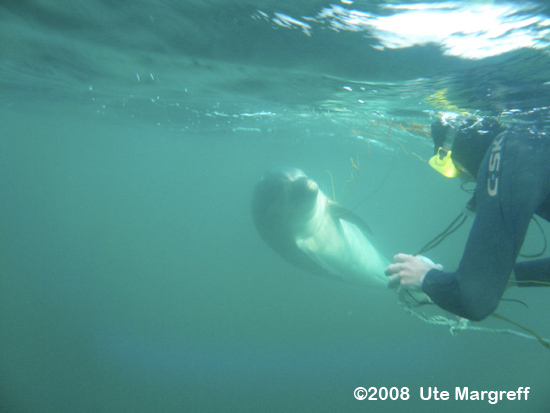 (A special interest and relationship with dogs is not uncommon with interactive dolphins, Fungie providing another example.) However, Ben is particularly well placed to indulge in what has become his favourite pursuit, as the Tory Hotel overlooks the main harbour. The dog apparently spends a large part of his day on 'look-out' for the dolphin, often pacing up and down the pier when the ferry is expected, and if the dolphin arrives with it he is straight into the water. Although not previously interested in swimming at all, Ben now spends an hour or two at a time in the sea with the dolphin, with hardly any break on land at all, and can repeat the exercise several times a day! "By the end of our 2½ hour swim, she had presented her belly to me and rested her head in my arms and on my shoulder, with her eyes closed, in what seemed like total contentment.... I rarely get cosmic about such encounters, though I am grateful for each one, but this dolphin really moved me in a huge way". (At this time Duggie was thought to be female.). John also points out that Duggie does not linger in the main harbour if there is nothing going on there. He spent five days, in fact, checking out the smaller harbours all around the rocky coastline of the island, before hooking up with Duggie, and comments, "..you could move about the island for weeks and not be in the right place at the right time". He adds, "I did find her at the back of the island on another day, in the company of a huge black seal, but I had no snorkelling gear with me. So I didn't brave a swim, but she did swim up to me at the rocks and we had definite eye to eye contact many times". Duggie will come into the main harbour even late at night as if to see if there is anything going on, and he also stayed around the island during the winter months of 2007/8. As of March 2009 we have not had a sighting since November 2008 but we hope he will be back before the summer. Duggie is drawn to all boats, like most interactive dolphins, and regularly accompanies the island ferries approximately half-way to the mainland. He also deliberately splashes people on board the ferry. He is very interested in outboard engines, but has suffered no injuries as a result. He has a few particular favourites amongst the fisherman but all of them are careful around the dolphin and protective of him without being fussy.